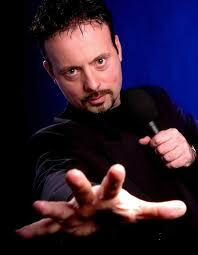 KARMIC RETRIBUTION. That must be it. 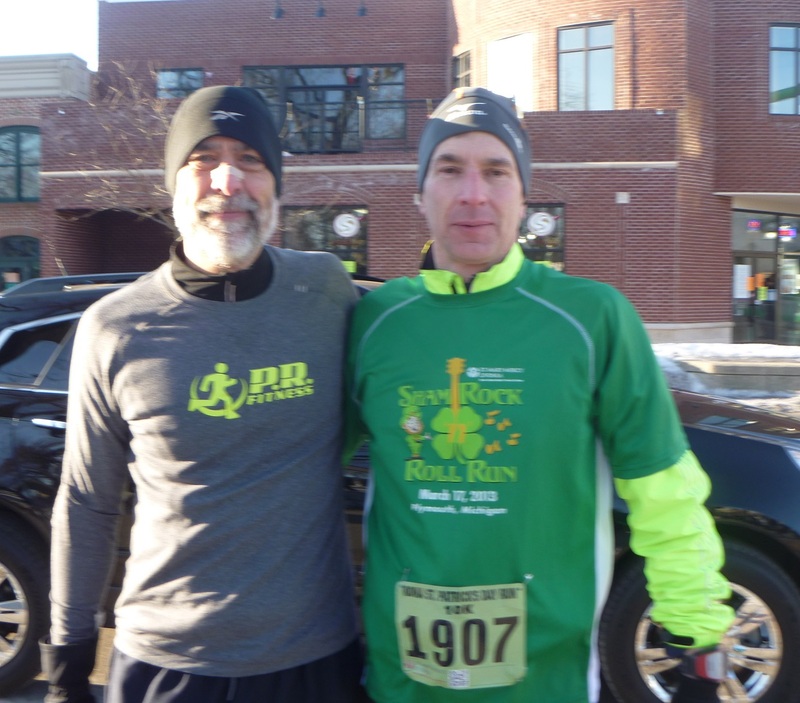 As payback for my perfect-weather Dances With Dirt race last week in Florida, Nature turned the polar vortex back on for this morning’s ShamRock ‘n Roll 10K. In another tweak of cruel irony, the race is part of the Kona Running series – hardly a name that evokes sub-zero wind chills. But I’d volunteered to pace it, so I pulled on two pairs of tights, slipped a green shirt over my Heater Hog and wind jacket, and headed to Kellogg Park in Plymouth. And to my surprise (well, not really) the turnout was as strong as ever and the costumes just as wild. 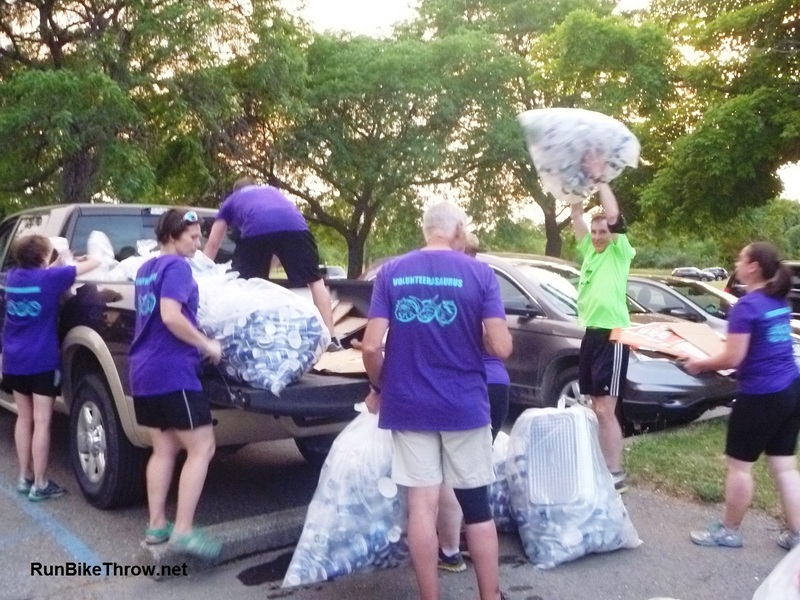 There were so many runners that wave starts were used for both the 10K and 5K. I was grateful he said that. Because I apparently wasn’t done paying for the great experience last week. Cold? No problem – we’re PR Fitness! For the first time in a Kona race, I paced solo. Usually Larry assigns two or three people per time, but understandably he was a few pacers short today. So I took the 52 minute sign and assumed my place in the starting queue. The horn sounded at 7:30 and off we went. I started in the back of the first wave, so I had to work through the crowd for about a half mile to get to my target pace of 8:23 per mile. And just as I was settling in, my right shoe came untied. I’ve run with an untied shoe before – even set a 5K PR that way – and my hands were numb despite the double gloves, so I stuck it out a while. By the end of mile 2 my hands had thawed, so I pulled over. Procedure: Put sign down. Take off two sets of gloves. Tie shoe, with double knot. Put gloves back on. Pick up sign. Resume running, faster, so I can catch up. This wasn’t a problem for me, but it meant I was passing a lot of people. “I thought you were [already] ahead of me,” a woman said as I went by. Now I felt guilty; the runners around me may not have been as fast or as fit as I am, but they were working hard. It couldn’t have been encouraging to see a pacer pass them. But it was only until I got back on target. As the end of mile 4 approached, I was just about there – and then my left shoe came untied. This time I stopped right away and duplicated the above routine, except for jamming on the gloves rather than fitting them on right. And I was determined not to embarrass more runners, so I lowered the sign and took off in a sprint. After a bit I glanced at my watch to see when to slow down – and it had shut off. Battery failure. Bundled up but rarin’ to go! The 5K starts. Now there was nothing for it but to make it look good. So I slowed down and just winged it, and headed toward the finish line with head and sign held high. And after all that, I finished at the 53:26 mark. Given I’d crossed the start line over a minute after the gun, I was remarkably close to target. Maybe the cosmic spirit likes me after all. Right afterward, someone came up to me. “Thanks for keeping the pace,” he said. “Hey, no problem,” I replied. 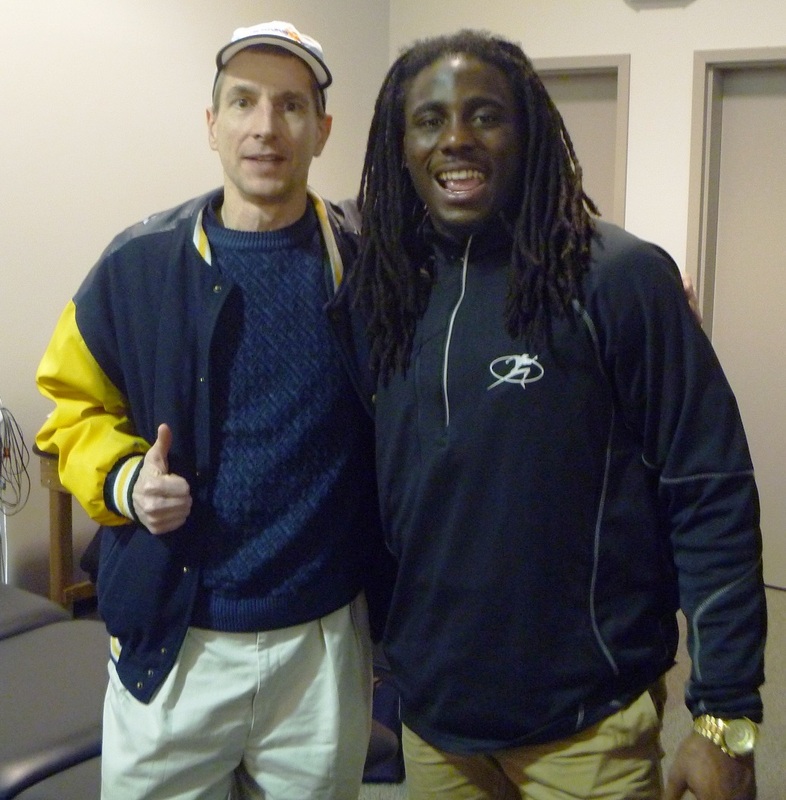 Me with another famous “Shoelace”, Denard Robinson. Taught him everything he knows about running with untied shoes. 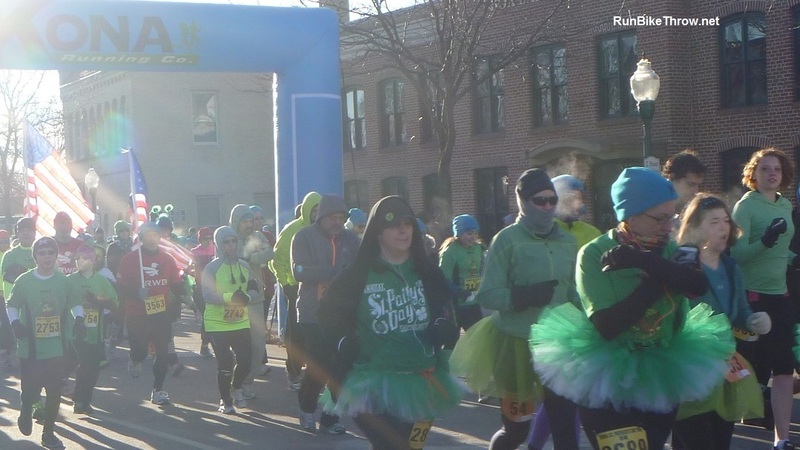 This entry was posted in Running & Cycling and tagged 10K, 50, Denard Robinson, fitness, karma, Kona Running, MI, pacing, plymouth, PR Fitness, Running, Shamrock 'n' Roll. Bookmark the permalink. I paced those races too! I paced 65 minutes in the 10K and 10 min/mile in the 5K. What was going on? One of my shoes came untied twice during the 10K and that never happens. I have those bumpy shoelaces that don’t come untied. I did have a co-pacer so he took the sign both times I had to tie my shoe and then I caught up to him. 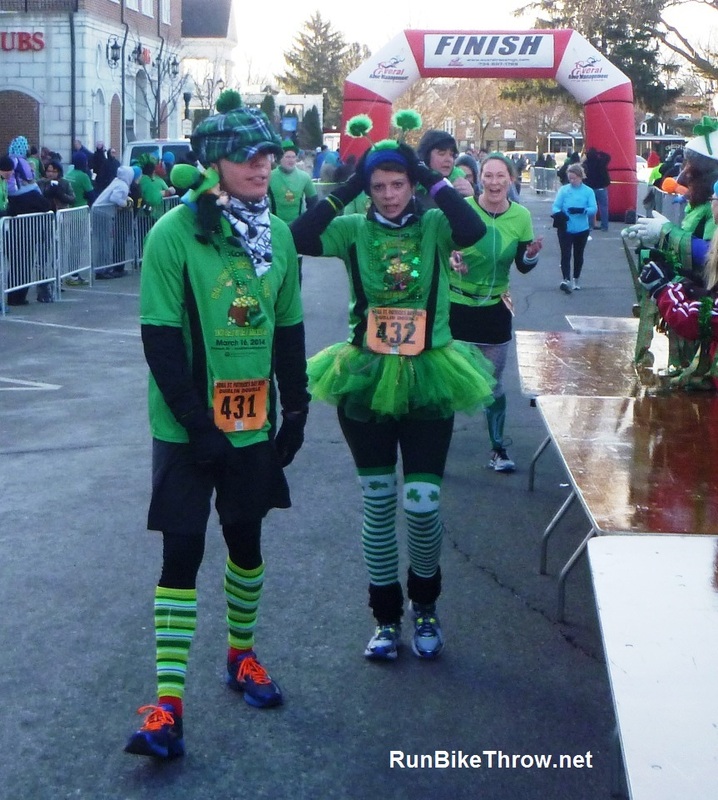 I paced 10 minute miles in the Halloween race last year and then again in this race. Both times, people were constantly telling me that I was going too fast. I set my Garmin to give me a split every 1/4 mile when I pace and I was coming in right on 2:30 each time so I was right on pace. I guess people do not like being passed by a person carrying a sign that says 10 minutes! Funny – usually my pace mates tell me I’m going too fast. We’ve had some (friendly) debates about whose watch is more accurate and what the exact per-minute pace should be. Then I finally get to run it MY way, and look what happens. Thanks for letting me know I’m not alone with the shoelaces! How to tie your shoes. Learn before kindegarten…”make little bunny ears” etc. etc.